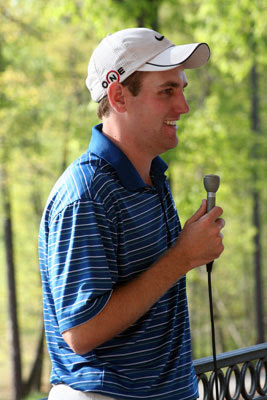 Bogart, GA (Apr 16, 2009) - Last year, former University of Georgia golfer Brendon Todd fired up the Athens faithful when he made it into the final pairing on Sunday in the 2008 Athens Regional Foundation Classic. Unfortunately, he ballooned to an 80 and finished in a tie for 25th place. immediately following his Thursday round. That did not stop him from returning to Jennings Mill for this year's tournament. And did he do it in style. On the par-3 17th hole, he pulled out a 7-iron and hit it right at the flag. It landed about 3 feet in front of the hole and rolled in for an ace. "This was the first hole-in-one that I have had in competition," Todd said after the round. hole-in-one that moved him to 5 under par. The ace put him at 5 under par, one shot in back of the leaders. Unfortunately, he bogeyed 18 to finish 4 under in a tie for 5th place. 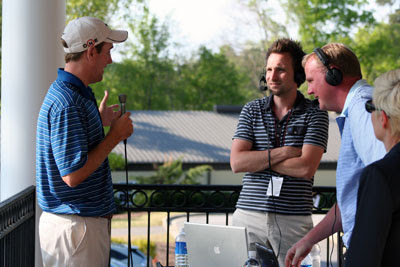 Todd tees of from Number 10 at 7:40 AM tomorrow morning. Come on out and support your Bulldogs! Photographs Copyright 2009 by Eye on Sports Media/The Cayuga Group, LLC. Ken Will Morton "Oh My Lord"